Knighted by King Charles II of Great Britain in 1663. Sir George Lockhart’s legal skills were one of the finest in the country. He was a charming man, whose oratory skill rarely failed to draw admiration in all. In 1672 he became a Dean of the Faculty of Advocates. Two years later, most unusually for Sir George the court decided a case against his client. He requested of them an appeal to parliament. Remember, this was before the dissolution of the old Scots parliament upon the Act of Union in 1707. The judges considered this disrespectful and illegal. The Government agreed and Sir George Lockhart was debarred from his profession at the pleasure of the king. As an act of huge respect for the man, fifty advocates cast off their gowns and wigs, withdrawing from their legal careers. They were then banished from Edinburgh! This resulted in suspension of almost all legal business for twelve months. Only the intervention of the great Sir George Mackenzie enabled the return of those advocates. Sir George Lockhart defended Covenanters and a man accused of shooting an Archbishop. He even acted as counsel for the Earl of Argyll in his trial for high treason in 1681. He was made Lord President of the Court of Session four years later. His legal brilliance did not prevent him from a tragic end however. 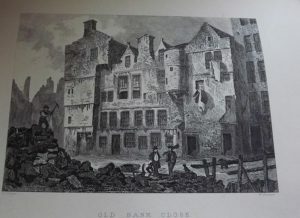 On Easter Sunday, which in 1689 fell on 31st March, in Old Bank Close near the top of the Royal Mile he was shot in the back. The man who pulled the trigger? Chieslie of Dalry, a man well known for violent and unrestrained passions. In a recent case between Chieslie and his wife which had come before Sir George, the Lord President had awarded maintenance to the wife. In revenge Chieslie threatened harm to his Lordship. Sir George was aware of this but paid no heed. That Sunday, with loaded pistols Chieslie went to St Giles, where Sir George worshipped. At this time Sir George resided in a famous mansion called Robert Gourlay’s house. Today this is the site of a branch of the Bank of Scotland at the north end of George IV Bridge. Chieslie followed Sir George home after church, before shooting him as he was about to enter his mansion. Lady Lockhart, who was confined to bed, sprang up on hearing the shot, ran to the entrance of their home in her nightdress and dragged her husband inside. He died in her arms. Chieslie was captured immediately and boasted, “you see I don’t do things by halves”. The following day he was sentenced to death by the Lord Provost. He was dragged on a hurdle to the Mercat Cross on the Royal Mile. When he arrived he was still alive, just. The right hand with which he had fired the pistol was struck off and he was hanged in chains to die. Lord President Sir George Lockhart’s corpse was laid to rest beneath Greyfriars Parish church.